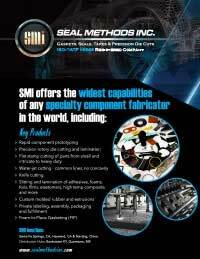 We are the world’s most comprehensive specialty components fabricator and a global leader in die-cut solutions. Our diversified manufacturing technologies have allowed us to service the automotive market with a wide range of solutions. We supply finished components manufactured from foams, elastomers, composites, films, high-performance gasket materials, graphite, and plastics, as well as pressure sensitive tapes, adhesives, and other specialty materials. From battery components to interior noise and vibration barriers, Seal Methods has the material knowledge and fabrication skill to create components for even the most demanding situations. As one of the first gasket manufacturers to achieve ISO:9001 and ISO/IATF 16949 (formerly QS-9000) certification, we maintain a leadership position as a supplier the Electric Vehicle Market. Our manufactured products can be found in many different EV applications, but particularly in the battery, perhaps the single most demanding component in an electric vehicle. Through long-term partnerships with leading raw material manufacturers, we have access to the most cutting-edge materials at very competitive prices. In electric vehicles, battery packs in vehicles are placed inside panels with upper and lower housing. Gaskets or seals are used to separate these sections and prevent particles and liquids from leaking into these housing sections. As with hybrid vehicles, electric vehicle battery systems are extremely sensitive to temperature changes, so these gaskets and barriers fulfill critical functions in controlling heat, as well as containing gas and liquids, and minimizing vibration and noise. We have a range of fabrication techniques available, from extrusion to molding, and die cutting. Our sales engineers guide you through the selection of an almost limitless number of choices to find the one most appropriate — both performance-wise and price-wise — for your application. SMI in-house capabilities mean our experts can specify, design, and manufacture everything on the site, so our clients know they’re getting the right material for the functionality, as well as cost savings and exceptional quality control. With decades of experience, 350,000 square feet of capacity, and quality certifications you can rely on, Seal Methods is an industry leader for the highly specific needs of the electric vehicle market. Through process design and effects analysis, statistical control of variation, and team-oriented problem solving, we aggressively pursue improvements to our quality system and have brought our manufacturing systems to an unparalleled level of performance. Call or email us today to learn what we can do for your electric vehicle business.